From a life-sized rhinoceros to a colourful cluster of stupas, Mikaela Castledine’s large-scale yet intricate crocheted works have been delighting viewers at Sculpture by the Sea in Cottesloe and Bondi since 2013. The much-loved WA artist and writer will be returning to SxS Cottesloe in 2018 with two collections of cats. Ahead of the exhibition opening this week, Castledine took some time to chat to Seesaw about her work. 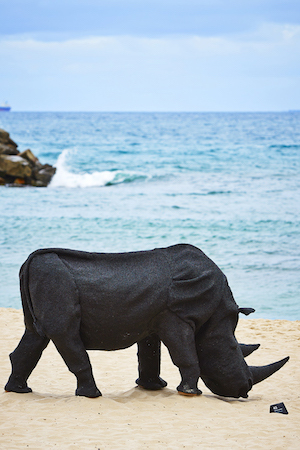 ‘While I can say my full-sized rhinoceros took six months to crochet, it was an intense six months.’ Mikaela Castledine’s ‘gift of the rhinoceros’, ‘Sculpture by the Sea’, Cottesloe 2014. Photo: Jessica Wyld. Mikaela Castledine: I don’t think there is a road to becoming an artist or writer – it is more like a park where you wander about down enticing little paths, into clearings of sunshine and shadowy thickets. My mother was an artist and my father a craftsman, engineer and farmer. Both families had a high regard for literature and music, my grandmothers both played the piano and sang, like good women of the early 1900’s all did, and they both read voraciously and wrote well. I was born with an appetite for words, learning to read by the age of three and writing poetry by the age of about seven. I had my first poem published in my early teens and writing poetry was just something my brain did. It is just the way I think. My mother had a difficult early life disrupted by war and dislocation and she wanted safety and security for her children so discouraged us from pursuing the arts as careers. Consequently, being the good girl I was, I studied science instead. Also consequently, being children chafing under parental influence, we all four eventually went on to be artists, writers, actors, singers, directors, comedians and all manner of unsafe and insecure professions. Growing up in an art house makes you understand the point of art, that it is a way of expressing yourself, not just a means of exercising some inherited skill. It means that art is the tool you reach for first when you need to make sense of the world. I never “wanted” to be an artist and a writer – I always just was. 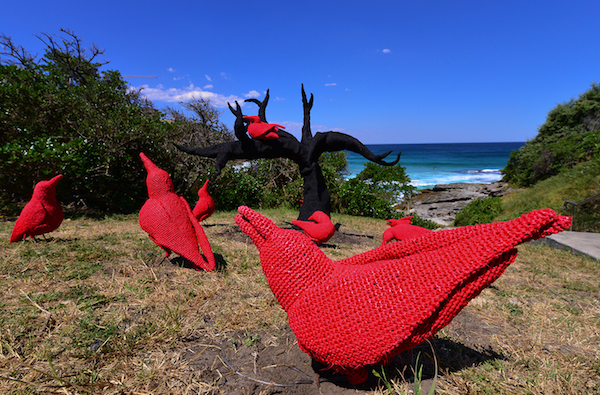 ‘I like macabre and the slightly dark and edgy topics.’ Mikaela Castledine’s ‘east of the mulberry tree – the legend of the ten red crows’, ‘Sculpture by the Sea’, Bondi 2013. Photo: Clyde Yee. S: You work in various mediums – paper collage, crochet and words – how did you come to work across such a broad spectrum of artistic forms? MC: Words and colours and shapes, they are all just tools in a box. It is just a matter of selecting the appropriate one for the job at hand. My mother worked for the Red Cross teaching hand crafts to rehabilitating patients. She was proficient at any form of craft invented (except crochet) She had a huge studio full of every imaginable art medium. My father gave up engineering in the 1970s to build spinning wheels and had a huge workshop full of every possible tool. It was my father who taught me to crochet when I was about 9. These were our playgrounds as children. Making the choice of which medium to use came down to interest and finding you had a knack for a particular craft. It was only in the last year or so that I had the revelation that the one craft that my mother was not proficient at was crochet and maybe that was why I chose it – just to be different. ‘I don’t know why people think there should be a distinction between the crafts that traditionally fall into the “women’s work” category and those that don’t.’ Mikaela Castledine’s ‘Big Intention’, ‘Sculpture by the Sea’, Bondi 2016. Photo Clyde: Yee. S: What drew you to crocheting art (as opposed to crocheting, say, beanies)? Should there even be a distinction between crochet as art and crochet as craft? MC: Ooooh! this is a big, big topic on which I have much to say but I will try to distill it for you. Crochet is a tool with which you can make sculptures or beanies. Welding is a craft with which you can make sculptures or furniture. Clay making is a craft with which you can make sculptures or bowls. (Wordsmithing is a craft you can use to write poems or hate speech!) I don’t know why people think there should be a distinction between the crafts that traditionally fall into the “women’s work” category and those that don’t. But that there is a distinction I certainly acknowledge and try to fight against. Just this week I gave a speech to a fibres and textiles group about transfiguration – the magical process that makes a crochet piece an art work and not a toy. I have a personal theory about art and it goes like this: Something is art if the artist who produced it intends it to be art. Whether it is good or bad, or derivative or original is beside the point. If my intention when I set about making a work is to make art – then the work is a piece of art. So intention is the first and most important attribute. Secondly I think that as an artist, you are the choices you make. So the materials I use, the way I choose to wield them, the scale of the work – larger than life or smaller, the colours, the lack of eyes etc., all these choices not only make my pieces art but they make them mine. Then it comes down to themes. I am very interested in the way human beings act and think. I like macabre and the slightly dark and edgy topics. Lastly the most common distinction between art and craft is that craft should be useful and art (appears to be) not. So essentially the difference between the dome I have just made for a piece referencing religious buildings and a beanie is intention, choices, theme and use. Does that make sense? Obviously I didn’t distill it that much… Sorry! S: It does! How long does it take to crochet a large-scale work? MC: I tend to crochet, on average, about 10 hours a day and I work pretty much seven days a week so while I can say my full-sized rhinoceros took six months to crochet, it was an intense six months. The subject matter may be feline but Mikaela Castledine’s ‘Hatab’ is a comment on human behaviour, from the bizarre to the predictable. MC: As I said earlier I am very interested in human beings and almost all my animal and architectural sculptures are actually about people. I travelled to Egypt in 2017 and decided to investigate cats in ancient Egyptian culture. What struck me as interesting was that cats were either deified or mummified. They were either worshipped as gods or exploited as a commodity, bred to be killed and mummified and sold for funerals. Similarly around the world cats hold these two extreme positions – in China there are either the ubiquitous lucky waving cats or soup. In Australia they are either your cosseted baby or feral. The thing about these extremes is the cats always remain the same. The cats are just cats, the only things that change are our perceptions of them. The only difference between your family pet and a feral cat is its address! I decided to investigate the idea of feral cats being different, more dangerous – the way we like to imagine them. My cats are big and black and slightly misshapen like a Frankenstein monster animal, but still the viewer tends to look at them and say, “Oh that looks just like my cat! My cat sits just like that.” They ignore that some of them have prey in their mouths and just see their version. I find this interesting. My piece for the “Sculpture Inside” section of “Sculpture by the Sea” is called Hatab which means firewood in Arabic. 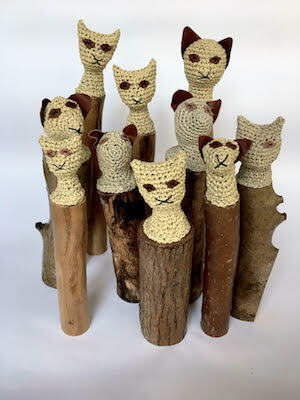 It is based on an apocryphal story that when explorers dug up the Egyptian tombs they found tens of thousands of mummified cats, ignoring the facts that these objects were thousands of years old they decided to use them for firewood. So while the mummification of cats in the first place was bizarre human behaviour, the destruction of ancient artefacts for short term gain is sadly predictable. Pictured top: Mikaela with the cats that compose her work “Feral” which will be on display at the “Sculpture by the Sea” 2018 in Cottesloe. 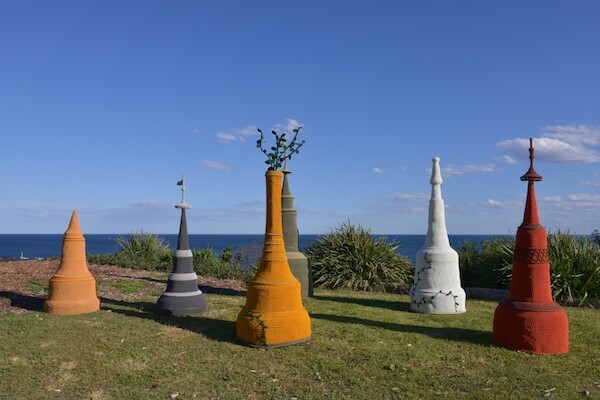 “Sculpture by the Sea 2018” opens at Cottesloe Beach, 2 March.